We talked the other day about how Quake Champions is trying to reclaim the legacy of the first person shooter it started along with Doom and Wolfenstein back in the 90s. While id Software is doing everything it can to stay relevant, other, smaller developers are celebrating that era of games, each in their own way. Two upcoming shooters look to reclaim everything about those shooters, from the pacing and textures to the enemy types and even marketing. Two games trying to grab onto that nostalgia are STRAFE and DUSK. And yes, they’re both all in caps just like that. Note that both games were played in a pre-release state, and may have differences at release. Both of these games start from the conceit that they were made in the 90s. (Hint: They weren’t.) That gives each game the excuse to stick hard to all the trappings of games from those days. 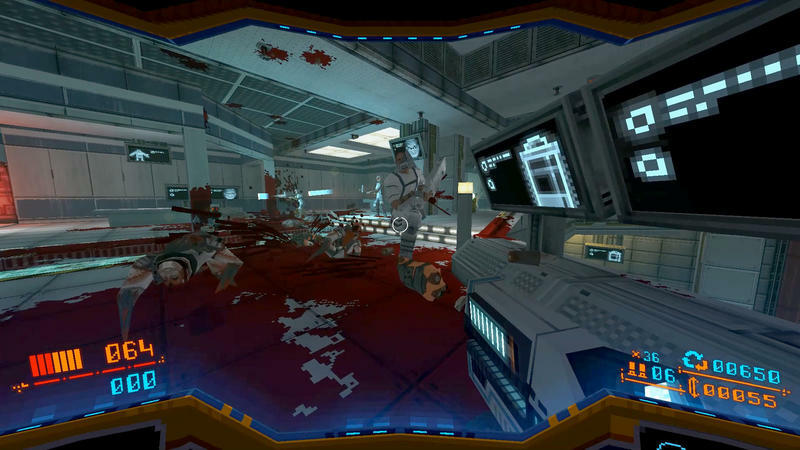 STRAFE takes a bit more liberty with the idea and plays it with a bit more of a smirk. 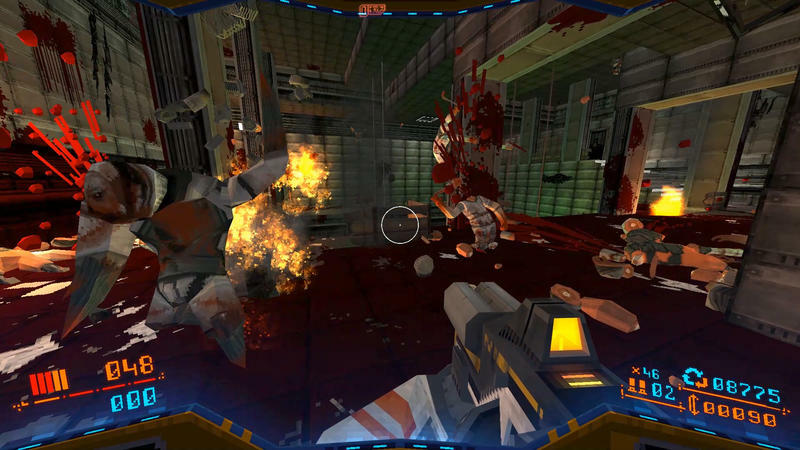 While games in those days were mostly bespoke creations with hand-designed levels and enemy placement, STRAFE uses procedural generation to ensure a new play experience every time. At the beginning of each play session, you start out by picking a weapon. You can go in with an assault rifle, a shotgun, or a laser, depending on your preference. From there, you’re thrown in. The entrance greets you the same way each time, with a busted sign and a dead scienceman. Once you turn the corner, the fun begins and is relentless right up until you die. From there, you’ll pick up weapons with limited ammunition, as well as tons of scrap that can be converted into power-up items. Health items and armor are sparse. This game wants you to die, and die often. This is a game for people who love the moment-to-moment play of shooters more than the satisfaction that comes with advancement or the enjoyment of video-game tourism. The game is expected to take a skilled gamer just a couple hours to plow through, but the amount of dying necessary to learn the ins and outs of the level design will extend it far past that. The procedural level generation is novel, but more and more, I’m finding that it doesn’t really add any value for me. I started to become really conscious of this last year with No Man’s Sky, and it’s something I notice each time I sit down with a game like this. Even in a heavily skill-based game, the environment plays a role in my enjoyment. It’s easy to tell when a game’s levels are generated rather than made; the flow just isn’t the same as what a human can craft. The memorable moments are what kept those shooters of yore burned into my mind, and there’s just nothing unique in these levels. The shooting is fun, but it’s not terribly memorable. It’s not so much that STRAFE feels like a game from 1996 so much as a memory of it, replayed back over and over again, getting further from the source. 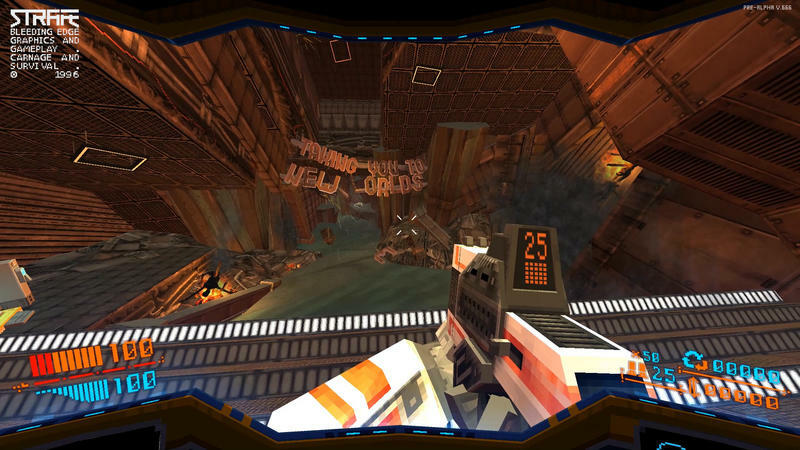 Procedurally-generated levels are all the rage right now, and it makes sense to connect that to a lo-fi, high-intensity shooter like STRAFE, but the union isn’t quite the peanut-butter-and-chocolate I was hoping for. Even so, shooting is fun and fast. The game is brutally difficult (I’ll see you in the comments), so games are often short and tense. As I get better at the game, I’m getting better stories out of it, which is where that procedural generation starts to work. On the other side of the coin is DUSK. This game wears its inspiration on its sleeve. It might as well be a full bodysuit of inspiration. While we remember Quake, Doom, Wolfenstein, and Half-Life the most fondly, there were countless shooters during that era that tried to cash in on those. We called them “Doom Clones” back then. Each one was weirder than the next. 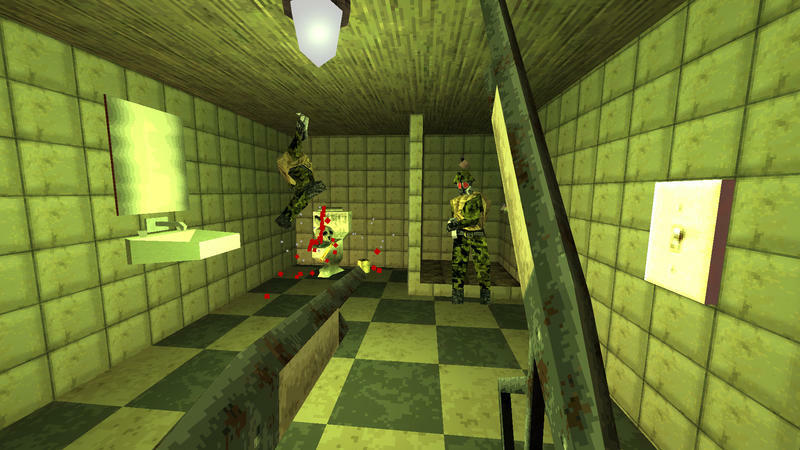 Games like Heretic, Hexen, and Redneck Rampage pitted us against everything from demons and mages to, well, rednecks. 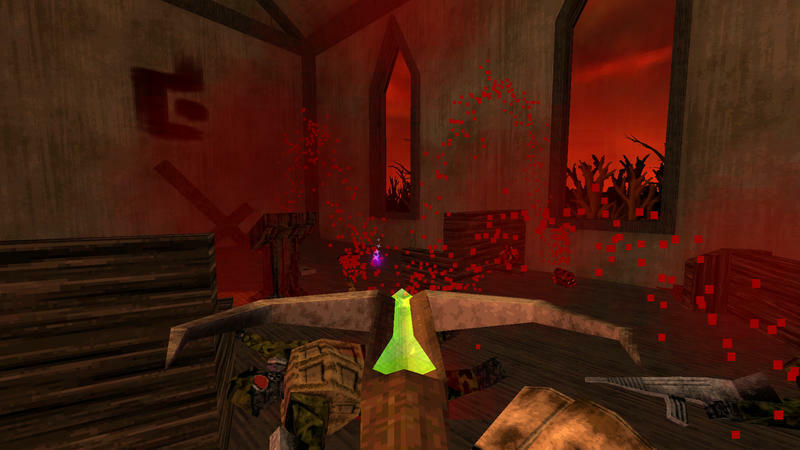 The enemy choices in these games often bordered on complete nonsense, and DUSK embraces that. Everything about this game is hand-crafted to be as dumb and silly as those games were. The game is still in beta with a 2017 release date planned, but it seems well on its way to accomplishing its goal. Of these two, DUSK is definitely more my personal style. 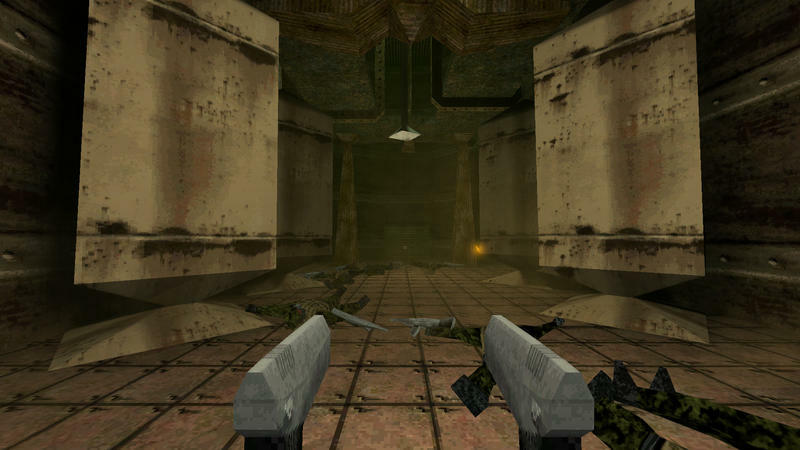 Super-obvious secret passageways lead to super shotguns, and tunnels honeycomb pieces of the level together. 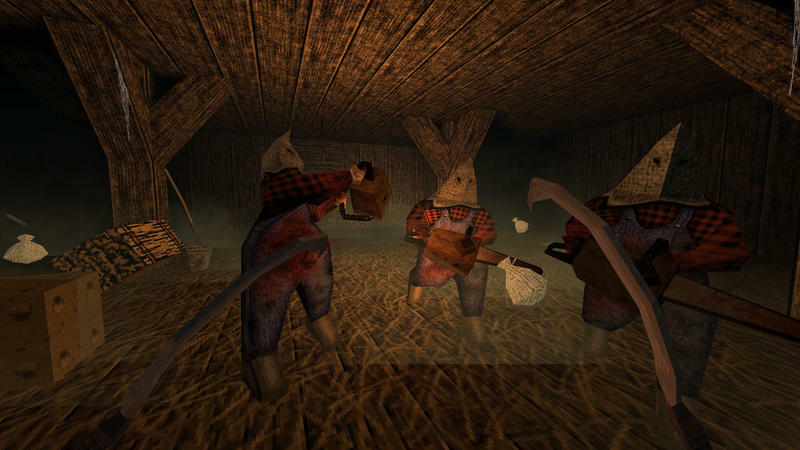 A desolate farm populated by cultists is home to shotgun-wielding scarecrows because of course it is. The pacing of what little developer David Szymanski has made available is fast, but it’s adaptable. 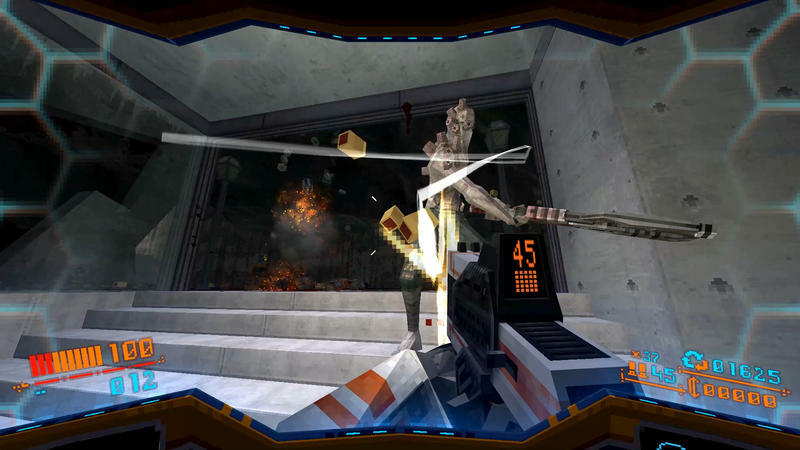 With STRAFE I always found myself off-guard somehow, while even in my less-spectacular moments with DUSK I found myself enjoying the game. I love the utter absurdity of the enemies. Despite the disparate concepts, they all feel like they belong there thanks to all those old shooters. Both of these games are pretty fun. The art style seems like a distraction at first, but what you get with both STRAFE and DUSK are games that perform well on just about any system. They also don’t ask for a whole lot out of your wallet. 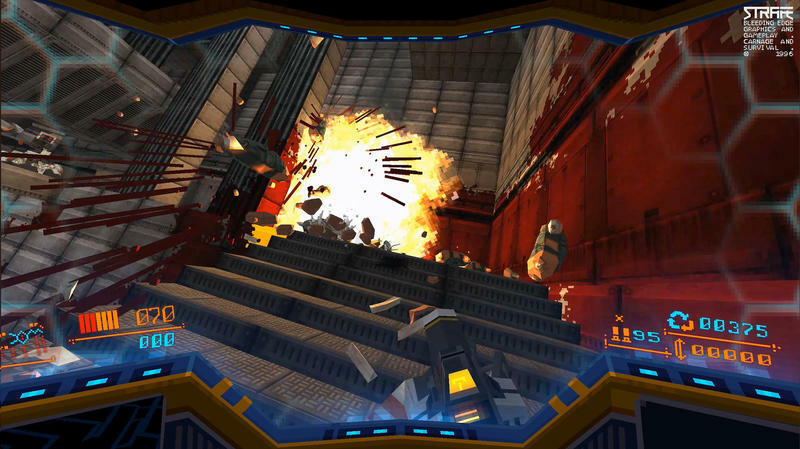 STRAFE is set to go for $19.99. DUSK doesn’t have a price, but I’d be surprised to see it go any higher than that. In that way, these games hew much more closely to their inspirations than Quake Champions ever could. They’re both single-player titles that ask you to buy in just once. There’s no marketplace, no skins or shaders. And for those of us who can’t really hack it in multiplayer, the solitary experience is a blissful one in its own way. 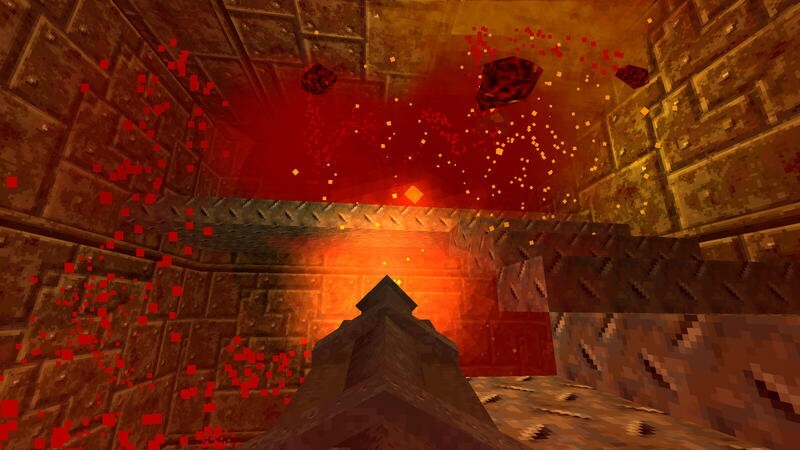 I remember spending evenings in my basement, in the dark, playing games like Doom, and in their best moments, STRAFE and DUSK call that feeling back to mind. 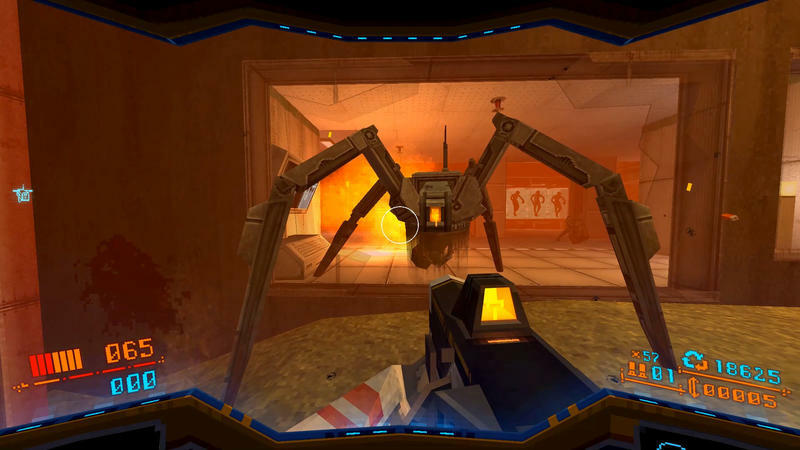 While DUSK isn’t dated for release just yet, STRAFE is just around the corner. The game is set for a May 9 release.